When the rains leave northern Ghana, so too do the men. Smallholder farm families who depend on rain-fed crops often send the men south in the dry season to find work – leaving children and wives – so they can send money back home. Mr. and Mrs. Gaetin in their garden. This annual departure fractures families, leaves women to care for their children alone, and often causes discord between husbands and wives. When fathers leave, elder children – especially girls – are pulled from school to help support their family. “Travelling south was a source of worry as it led to serious challenges between men and their wives,” Gaetin explained. In recent years, climate change has made predicting rain patterns difficult. As was the case this year, the spring rains were delayed, resulting in an unexpectedly long dry season. When the dry season is extended, food shortages become more serious, families become strained, and children’s health is threatened. When Gaetin heard that CFTC’s food security project RESULT was to begin training women and men on how to do dry season gardening, he became very excited. He knew that it meant that families would no longer be forced to separate. As part of the project, he also learned, through RESULT’s integrated gender equality training, the role women can and should play in contributing to the family income. As a consequence, RESULT is promoting healthy family relationships. Trying to grow food in the dry season has many challenges. The most obvious is the lack of rain. Although in many cases – even during the dry season – there are limited water sources available, they are often located too far away from farmers’ fields to be used to grow food. Farmers also struggle with plant disease management, poor quality seeds not meant to withstand the dry conditions, and crop destruction from animals. When yields are too low, families cannot survive, and the men head south to find work. Martin stands in his garden, ripe with onion plants. Martin – a father from the Upper East Region of Ghana – had tried dry season gardening before but animals destroyed everything he had grown. “The animals would always find their way to the site and end up destroying the crops and for that reason we hardly ever broke even,” he told us. With children attending senior high school, Martin needed to find a solution to earning an income – but didn’t want to have to leave his children and wife behind. When he was referred to the RESULT project, he was trained on dry season gardening techniques and provided with fencing materials to keep the animals out, along with fertilizer, quality drought-resistant seed, and water pumps to connect to a water source. The true test came last dry season, when Martin implemented everything he had been taught. 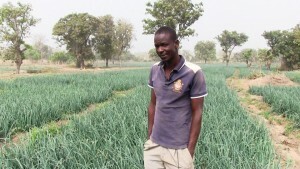 Before RESULT, Martin could barely make GH ¢500 ($170 CAD) growing vegetables. After his first season gardening with his new skills and inputs, he earned GH ¢ 3000 ($1000 CAD). With these funds, Martin not only paid for his children’s senior high school fees – but also his younger brother’s. And he didn’t have to leave them for many months to do so. “RESULT is yielding positive results and we (my family) are reaping its benefits,” he said. “Working with my husband in the garden keeps us together and strengthens our love for each other,” Augustina told us, explaining the importance of being able to grow food during the dry season. Augustina and her husband team up to cultivate vegetables. Augustina lives with her husband and children and they became involved in RESULT’s dry season gardening program when they learned it could help keep her husband at home. RESULT provided Augustina with a water pump and taught her how to use a nearby water source for her garden more efficiently. She also received inputs including vegetable seeds, fertilizers, and fencing materials to keep animals out. Having the opportunity to do dry season gardening with her husband has helped Augustina earn an additional income to support her family, and she is able to use the produce to feed her children nutritious meals from the vegetables she cultivates. It also means that she and her husband get to work towards their goals and raise their family together. “I am grateful to [CFTC and] the RESULT project for the support,” she said, smiling beside her husband in their healthy, growing garden. The Resilient and Sustainable Livelihoods Transformation (RESULT) project is a six-year, $19-million project funded generously by Global Affairs Canada and private donors.